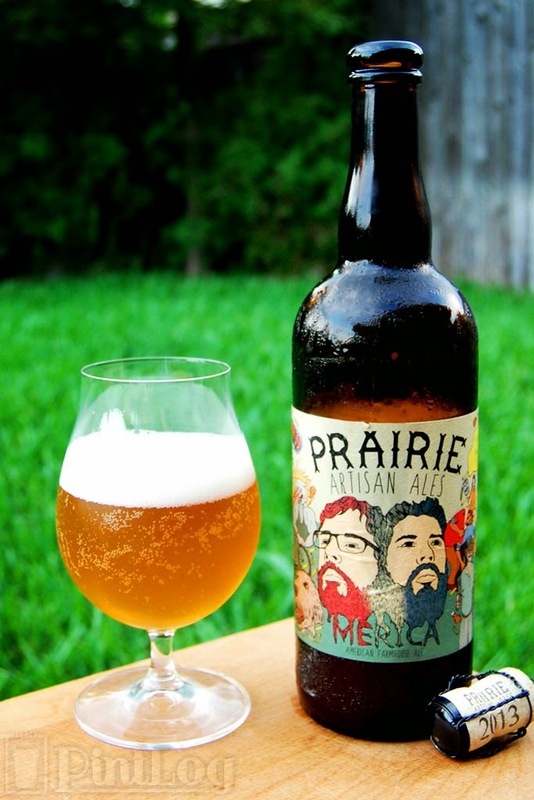 'Merica, another of Prairie's many Saisons, is a single hop, single malt variation of the style. The malt used is old school floor-malted Bohemian Pilsner, the hop variety is Nelson Sauvin (three pounds per barrel and dry-hopped), and the yeasts used are the house strain, two strains of Brettanomyces and a wine yeast. This is the last of the first four Prairie offerings that showed up here in Houston last year, all four of which were consumed over the course of a weekend where I sorta fell in love with this Oklahoma brewery. The Nelson hops provide white wine flavors while Brettanomyces add a juicy quality to the beer. Sounds good to me, let's light the fireworks and enjoy some good old 'Merica! Appearance: A hazy golden body capped by a little over a finger of white head that fades quickly, leaving no lacing. Aroma: A mix of tropical and orchard fruit, grassy, dank, and floral hops, barnyardy funk, white pepper, and pale malt. Just a hint of booze once it's warmed. Taste: Up front, grassy, tropical-fruity, and moderately bitter hops along with funk, dried orchard fruit and spices. Underneath, a crackery pale malt body grounds everything. Spice from the alcohol throughout. There's a lot of strong flavors here, but everything comes together nicely. Dry hops, pepper, and a hint of booze in the finish. Mouthfeel: Medium bodied with medium carbonation and a dry finish. Slickness from the booze throughout. Drinkability: This drinks much faster than the alcohol content would suggest, making this dangerously smooth. Verdict: 'Merica is another thoroughly enjoyable funky Prairie Saison with its own character. I'm really impressed with these guys so far, and glad they serve shelves here in Houston. Note: While this review is being published in 2014, the tasting notes contained within were taken when the beer was fresh in 2013.